Potassium is an essential element for plants. Soil contains soil colloids, clays and minerals, which fixate the applied Potash Fertiliser into forms of fixed/stable Potash or insoluble forms of Potash. Thus, plants can utilise only about 30% of the applied Potash. ii) Conversion / Precipitation of applied Potash by clay minerals to insoluble forms of Potash. Many micro-organisms play an important role in nutrient uptake for plants. One such micro-organism (bacteria) is Bacillus mucilaginosus, which is capable of mobilizing Potash to plants in all types of soil especially, low Potassium soils. Use of such bacteria is shown to increase the availability of potash in an usable form for the plants to absorb/ uptake. ECO-POTASH is a Powder formulation containing the Bacillus mucilaginosus. The product contains 1x 107 cells per gm of the product. When ECO-POTASH is mixed with or applied to the soil, it gets activated and starts multiplying. As these cells grow and multiply, they mobilise the available potash in the soil and make the same available to the root zone/ plant system, by cleaving the bonds between the Potassium and Silica molecules in the Clay and Soil Colloids, which immobilise the applied Potassium Fertiliser. ECO-POTASH makes available near the root zone "K" in the range of 30 to 50 Kg/ Ha. ECO-POTASH enhances availability of applied “K” Fertiliser by upto 15-20 %. ECO-POTASH enhances early root development, leading to increase in plant growth and subsequently greater yield. 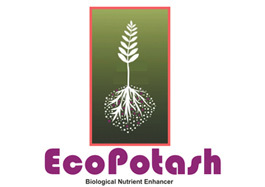 ECO-POTASH is easily compatible with all other microbes in the soil/ root zone. ECO-POTASH elicits rapid cell development in plants. ECO-POTASH increases production of plant proteins. ECO-POTASH increases the efficiency of water use in plants. ECO-POTASH increases the stand persistence, longevity and hardiness of crops/ plants. ECO-POTASH does not disturb ecological balance as it is environment friendly. eed Treatment: Mix 10 gm of ECO-POTASH in sufficient water and coat the 1Kg of seeds well with this solution and shade dry before sowing. Seedling dip/ Drenching: Mix 1000 gm of ECO-POTASH in 50 litres of water and dip the seeding for 60 minutes before transplanting Soil Application: Mix 1000 gm of ECO-POTASH with 100 kg of Farmyard manure and broadcast it over one acre of land before first irrigation. Cereals: Wheat, Sorghum, Barley, Maize, Rice, etc. Mix ECO-POTASH @ 1000 gm / acre in 50 Kg of well decomposed organic matter along with the recommended dose of potash fertilizer. This mixture of material should be kept under shade for over night and maintain 40% moisture and broadcast onto to the soil on the next day. Vegetables in open Fields: Mix ECO-POTASH @ 1000 gm / acre in 50 Kg of well decomposed organic matter along with the recommended dose of potash fertilizer. This mixture of material should be kept under shade for over night and maintain 40% moisture and broadcast onto to the soil on the next day. Green House Vegetables: Beans, Black eyed Peas, Cabbage, Cauliflower, Lettuce Mix ECO-POTASH @ 2000 gm / acre in 50 Kg of well-decomposed organic manure along with the recommended dose of Potash fertilizer and keep it under shade over night and maintain 40% moisture. and broadcast onto to the soil on the next day. Other Green House Vegetables: Carrot, Cucumber, Melon, Mustard, Onion, Parsnips, Peas, Pepper, Potato, Spinach, Tomato, Turnips, Zucchini Mix ECO-POTASH 2000 gm / acre of the material in 50Kg of well- decomposed organic manure along with the recommended dose of Potash fertilizer and keep it under shade over night and maintain 40% moisture. and broadcast onto to the soil on the next day. Flowers: Carnations, Tulips and other Flowers For closely planted crops, Mix ECO-POTASH 1000 gm / acre to be mixed in 500 lts of water and apply 50ml to each plant as soil drench. Fruits like Grapes, Citrus, Figs, Banana, Pomegranate, Mango, etc. 5 to 10 Kg. Plantation Crops like Coffee, Tea, Rubber, Spices, Nuts, Sugarcane, etc. 4 to 8 Kg. Oilseeds like Sunflower, Groundnut, Sesame, Castor, Mustard, Soybean, etc. 3 Kg. Store in a well-ventilated place away from the heat and sunlight. » Unique Carrier Technology, enables the organism to establish in any soil type without population reduction or loss in performance activity. » Complements Action of Potash Fertilisers in the Soil. » No Toxic/ Poisonous residues in Food or Soil.